Pretty table centre and runner with toadstools and Autumn leaves and wall hanging with red squirrels. 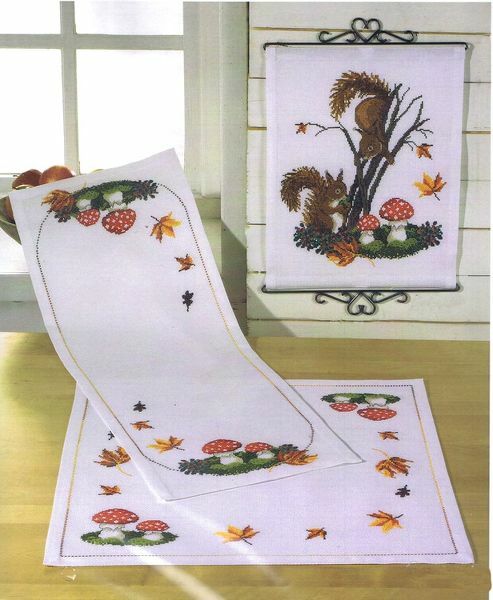 The table runner has half the overall design printed on two A3 sheets one with key. The pattern is worked in whole cross stitch and backstitch using 15 shades of stranded cottons over 130 by 270 stitches. needle, chart and stitching and finishing instructions.